We are 50m from the waterfront. You have three bedrooms and another two additional rooms with musical instruments like Steinway M, Harpsichord and various instruments from different ethnic background. The spacious kitchen is our most frequented meeting spot for our culinary and social gatherings. Once you are here, you find yourself like in heaven of simple life in nature and you do not feel the urge to travel a lot. But we are in the middle of europe, Germany, Austria and Lichtenstein are a 20 - 30 minutes drive from us. So you have endless options for every taste to explore and look around. Our car may be at your disposal if requested during simultaneous exchanges. P.S: We are sorry to say that we can only host non-smokers. Our house is suitable for children from age 6. Because of allergic reasons please bring no pets along with you. 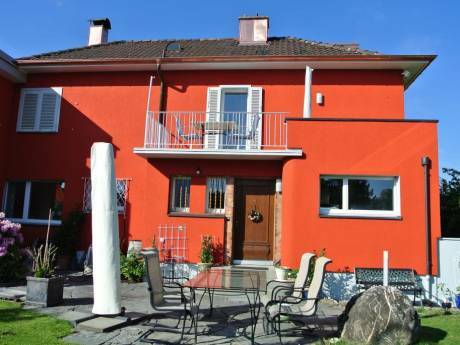 We are a retired couple with two children living at their own in Constance, Germany and London. If you want to know more about who we are and what we like there are two possibilities: the easiest way to find out more about us is to look at the pictures we have uploaded for you. And feel free to send us a mail with all your questions, we will be happy to answer every single one individually! Don't forget: Switzerland is a small country and most of it has "cute dimensions". So our house is not a castle and everything is reduced to the max. in order to let you breath and relax. Also distances are short and you have an unbelievable density of attractions close by which we often enjoy ourselves. We are interested to exchange with people who estimate aesthetic simplicity and carefull handling of places filled with love. We have close by countless attractions and activity possibilities for our guest who love nature, culture, sports, cities, shopping and whatever you can imagine. Most special: a few steps away from us you find all kind of lakeside sport and leisure activities and in winter time you drive in less than an hour to some of the family friendliest snow paradises nearby. Constance town, Germany one of the few big old cities that got no damage from world war2 is 20 minutes away. 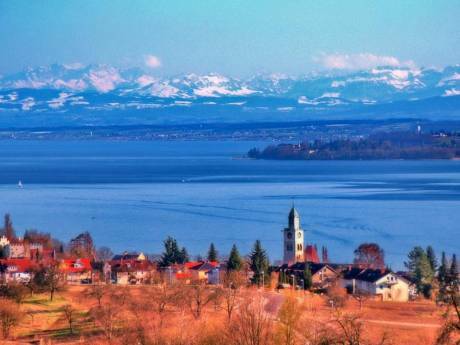 Bregenz town, Austria is 35 minutes and skiing in the Austrian alps is 50 minutes from here. St.Gallen town, Switzerland is 20 minutes and Zürich ca. 60 minutes from us. You can reach every place very comfortably, fast and easy also by local train, our station is 5 minutes from our home. Daytrips to Munich, Ulm, Stuttgart, Bern, Basel, Lucerne, Interlaken, Davos, Lugano etc. can be made by intercity trains starting 9 minutes from here.